Context: Most primary intracranial neoplasms occur as solitary lesions. Presence of multiple intracranial tumours with different histological origin in same individual or even collision tumours is exceedingly rare. Aims: With the advancement in neuroimaging techniques, more such synchronous tumours are being identified. The most common combination identified till date is meningioma associated with glioma. Our understanding of multiple, dissimilar intracranial tumours will gradually improve as more cases are identified, reported and studied. The explanations for the simultaneous occurrence of different primary intracranial tumours in the absence of phacomatoses or prior radiation exposure are at present hypothetical, and these tumours could be simply coincidental. 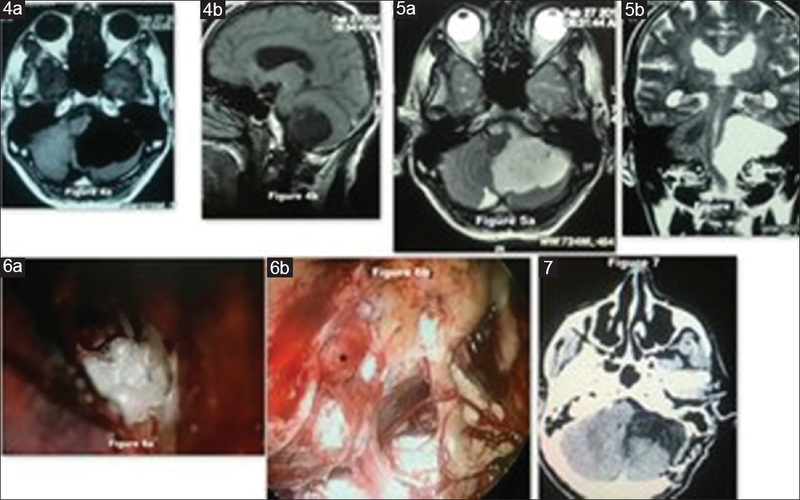 Material and Methods: We present here a series of four cases who had multiple intracranial tumours of different histological origin and were managed successfully. None of our patients had received radiation in the past or had any family history of phakomatoses. Conclusions: Simultaneous occurrence of histologically different primary braintumours is rare, and its preoperative diagnosis is still challenging. Syndromic association should be ruled out in patients of histologically different multiple brain tumours. Most common primary brain tumour associated with other histologically different brain tumours is meningioma. Thorough clinical and imaging studies are mandatory in these cases to provide optimal treatment. Simultaneous existence of primary brain tumors with different pathologies was described in not more than 0.9% of all primary brain tumors, but the majority of those cases were seen after radiotherapy or are associated with familial tumor syndromes., Different brain tumors of distinct histology can co-exist in the setting of phakomatoses or as a complication of radiotherapy. In the absence of these predisposing factors, this phenomenon is uncommon. When the lesions are in proximity, they are described as collision tumors and are extremely rare. A 36-year-old patient was admitted with complaints of headache and diplopia. He also had a history of two episodes of focal convulsion involving the left upper limb and lower limbs. On admission, his general examination was found to be normal. No neurocutaneous markers were seen. Neurological examination revealed left temporal hemianopia and ptosis of the right eye. Gadolinium-enhanced cranial magnetic resonance imaging (MRI) showed two different lesions in two different locations. An ill-defined mass lesion measuring 4 cm × 2.5 cm × 2.3 cm was identified in the subcortical region of the right frontal lobe with perifocal edema. It was heterogeneously hypointense on T1-weighted images (WIs) and hyperintense on T2WIs and fluid-attenuated inversion recovery (FLAIR) images [Figure 1]a. It showed mild patchy enhancement on postcontrast study [Figure 1]b. On MR spectroscopy, there was increase in choline/creatine ratio (4.9) and marked increase in N-acetyl aspartate and creatine peaks. The second mass lesion was noted in the sellar and suprasellar regions. It was hyperintense on T1WI, heterogeneously hyperintense on T2WI and FLAIR images, and showed peripheral enhancement on postcontrast study [Figure 2]a and [Figure 2]b. Superolaterally, it was stretching bilateral optic nerves and optic chiasma and laterally abutting the cavernous portion of bilateral internal carotid arteries with well-maintained flow voids. Preoperative laboratory analysis showed that no pituitary hormones were excessively secreted. Treatment was planned in a single transcranial approach, with a combined removal of the frontal lesion and subsequent removal of the sellar-suprasellar tumor through a right fronto-temporal craniotomy. The frontal lesion was grayish, hard nodular with cystic components, and gross total tumor removal was achieved. The sellar-suprasellar tumor was also subsequently removed through the same approach. It was soft, suckable, and grayish colored with some necrotic areas within, and gross total tumor removal was done. Postoperatively, the patient had no new neurological deficits. Histological examination of the right frontal tumor revealed anaplastic astrocytoma WHO Grade III. On immunohistochemistry, tumor cells were positive for glial fibrillary acidic protein and focally for synaptophysin. MIB-1 labeling index was 6%–8% in the highest proliferation areas. The histolopathologic diagnosis of sellar lesion showed pituitary adenoma with apoplexy. Postoperative MRI showed no residual tumor in either of the locations [Figure 3]a, [Figure 3]b, [Figure 3]c. The patient was discharged on day 8 with recommendation of adjuvant radio-chemotherapy. A 65-year-old man presented with complaints of mild intermittent headache for 6 months and imbalance while walking associated with tendency to fall toward the left side for 3 months. The patient also reported progressive decreased hearing in the left ear. On tuning fork testing, the Weber lateralized to the right and the Rinne test was positive in the left ear. Cerebellar signs were positive. Pure tone audiogram revealed severe sensorineural hearing loss “notch” at 2000 Hz on the left side and hearing sensitivity within normal limits in the right ear. A contrast-enhanced MRI showed a mass lesion in the left cerebellopontine angle (CPA) which extended inferiorly to the left cerebellomedullary junction and superiorly till the tentorium cerebelli. This mass predominantly demonstrated isointense on T1 [Figure 4]a and [Figure 4]b and hyperintense on T2WIs [Figure 5]a and [Figure 5]b and showed areas of restricted diffusion-weighted images without contrast enhancement, compatible with an epidermoid cyst. It measured approximately 4.5 cm (anteroposterior) × 3.0 cm (transverse) × 5.5 cm (craniocaudal). No other lesion could be visualized in the preoperative imaging. A left retromastoid suboccipital craniotomy was performed in the lateral semi-sitting position. After opening the dura, cerebello medullary cistern was opened and cerebrospinal fluid was drained to make cerebellum lax. The mass in the left CPA was encapsulated, pearly white, and flaky extending into the prepontine cistern and the foramen of Luschka compressing the brainstem [Figure 6]a. Tumor was seen encasing cranial nerves 5, 6, 7, and 8. Tumor could be sucked and some solid parts were removed in piecemeal fashion. Once the major part of the tumor was removed, we could see another encapsulated mass lesion adherent to the 7th and 8th nerve complex near the internal acoustic meatus [Figure 6]b. It was firm in consistency and moderately vascular. This mass lesion was excised completely keeping 7th and 8th cranial nerves intact. Endoscope assistance was taken to visualize and remove the hidden parts of tumor. The completeness of resection was eventually assessed by endoscope. Postoperatively, the patient made an uneventful recovery and computed tomography brain showed no residual lesion [Figure 7]. Histopathological examination (HPE) showed vestibular schwannoma (WHO Grade I) associated with an epidermoid cyst on the same side of CPA. He was discharged after 10 days with no fresh neurological deficits and asked to follow-up after 1 month for MRI brain. A 45-year-old female presented with a history of focal convulsions involving the left upper and lower limbs. Neurological examination was within normal limits. MRI brain revealed a 3.0 cm × 2.2 cm × 1.9 cm-sized ill-defined mass in the right frontal lobe involving the white matter. It was heterogeneously hypointense on T1WI and hyperintense on T2WI and FLAIR images [Figure 8]a and [Figure 8]b. 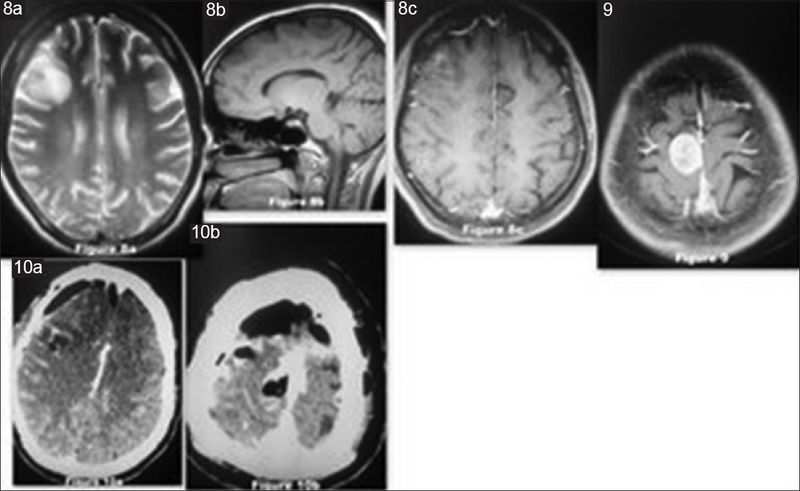 There was no enhancement on postcontrast study [Figure 8]c. The above findings were suggestive of a low-grade glioma. Another 2.4 cm × 1.8 cm × 1.6 cm-sized well-defined round extra-axial broad-based mass was noted in the right parafalcine location in the right high frontal region. It was iso-intense on T1WI and heterogeneously hypointense on T2WI and FLAIR images. It showed intense homogeneous postcontrast enhancement suggestive of a meningioma [Figure 9]. A right fronto-temporo-parietal craniotomy with Simpsons Grade II excision of parafalcine meningioma along with gross total excision of right frontal glioma was done. Postoperative images showed complete excision of both lesions [Figure 10]a and [Figure 10]b. On HPE, it was suggestive of low-grade glioma and psammomatous meningioma Grade I. The postoperative course was uneventful and the patient was discharged on the 8th postoperative day. A 14-year-old male presented with decreased vision and proptosis of the right eye. His visual acuity was finger counting at 2 ft in the right eye and 6/6 in the left eye. Rest of the neurological examination was normal. MRI brain showed diffuse fusiform enlargement of intra-orbital segment of the right optic nerve measuring 2.5 cm × 1.2 cm × 1.3 cm. It was hypointense on T1W, hyperintense on T2W/FLAIR images, and showed heterogeneous enhancement on postcontrast study [Figure 11]a. Imaging findings were suggestive of optic nerve glioma. Another ill-defined lobulated nonenhancing extra-axial heterogeneous lesion of size 2.1 cm × 2.8 cm × 2.2 cm was seen in the left CPA cistern. The lesion was hypointense on T1WI, hyperintense on T2WI, and showed restricted diffusion with corresponding low apparent diffusion coefficient values suggestive of epidermoid cyst [Figure 11]b. He underwent right pterional craniotomy with orbitotomy and gross total excision of optic nerve lesion. No intervention was done for epidermoid cyst as it was asymptomatic. HPE of orbital tumor was suggestive of ganglioglioma (WHO Grade I). The postoperative course was uneventful. Follow-up MRI at 3 months showed no residual lesion in the right orbit and no increase in the size of epidermoid cyst [Figure 12]. Giromini et al. reported the case of a primary central nervous system lymphoma in a child 6 months after extirpation of an astrocytoma, emphasizing the concept of collision tumors and their differential diagnosis. Coexistence of oligo-dendroglioma with anaplastic astrocytoma, juvenile pilocytic astrocytoma, pleomorphic xanthoastrocytoma, and metastatic breast carcinoma has been described in published literature. Poeata et al. reported three different cases describing simultaneous occurrence of meningioma with glioblastoma, pituitary adenoma, and acoustic schwannoma. Phakomatoses, such as neurofibromatous-2, and a previous history of irradiation are well-known causes for the development of multiple primary brain tumors. Several hypotheses have been proposed to explain the coincidence of two completely separate primary brain tumors of different histogenesis in the same patient: (1) tumors can develop entirely coincidentally; (2) the initial tumor can act as a stimulus on the surrounding cerebral parenchyma or meningeal tissue to induce a new tumor in different tissue; (3) a carcinogenic stimulus may develop tumors in different tissues simultaneously; or (4) a residual embryonic structure becomes the basis for subsequent multiple brain tumor development. Furthermore, several studies have addressed the role of endogenous as well as exogenous hormonal therapy on the risk of meningioma formation. Russel and Rubinstein made the hypothesis that the first tumor provides a stimulus for the surrounding brain parenchyma or meninges to induce a new tumor in a different tissue. Alexander proposed that residual embryonic structures form the basis for the development of subsequent multiple brain tumors. Some authors held carcinogenic stimuli responsible for the simultaneous development of different brain tumors and other attributed it as entirely coincidental. Glioma may develop due to neoplastic transformation of the reactive glial cells surrounding a meningioma. This process may be mediated by locally acting oncogenic factors. The most suspected substance is platelet-derived growth factor (PDGF) subunit alpha-R, which is the main receptor in astrocytoma. Astrocytoma growth is probably stimulated by PDGF in an autocrine mechanism. It is possible to develop a meningioma as secondary malignant neoplasm due to transformation of the arachnoid cells in response to the growth of a subjacent glioma or after radiation therapy. Co-existences of multiple intracranial tumors of different histological lineage that are seen should be reported more frequently, but are very rarely reported in the pertinent literature. Notably of the fact that none of our patients had any family of phakomatosis makes it a unique case series in the relevant literature. Syndromic association should be ruled out in patients of histologically different multiple brain tumors. Thorough clinical and imaging studies are mandatory in these cases to provide optimal treatment. However, based on our case and published literature, we assume that increased research work could provide significant understanding in the development of multiple primary brain tumors. Butti G, Giordana MT, Paoletti P, Schiffer D. Multiple primary intracranial tumours of different cell types: Association of anaplastic astrocytoma and acoustic neurinoma-with review of the literature. Surg Neurol 1982; 18:336-42. Naydenov E, Marinov M, Nachev S. Two different primary brain tumors, glioblastoma multiforme and pituitary adenoma, in association with colorectal carcinoma: An unusual case of nonfamilial Turcot's syndrome? J Neurol Surg A Cent Eur Neurosurg 2012;73:410-2. Committee of Brain Tumor Registry in Japan: Brain tumour registry in Japan. 1987;6:50. Akagi K, Nakatani J, Ushio Y, Matsuoka K. Multiple primary brain tumours: An acoustic neurinoma associated with meningioma in the lateral ventricle. No Shinkei 1973;25:1823-7. Brennan TG, Rao CV Jr, Robinson W, Itani A. Tandem lesions: Chromophobe adenoma and meningioma. J Comput Assist Tomogr 1977;1:517-20. Giromini D, Peiffer J, Tzonos T. Occurrence of a primary Burkitt-type lymphoma of the central nervous system in an astrocytoma patient. A case report. Acta Neuropathol 1981;54:165-7. Kanamori M, Kumabe T, Watanabe M, Tominaga T. Anaplastic astrocytoma and anaplastic oligodendroglioma occurring 6 years after subtotal resection of a central neurocytoma. Case report. J Neurosurg 2007;107:185-9. Kan P, Gottfried O, Blumenthal DT, Townsend JJ, Drozd-Borysiuk E, Brothman AR, et al. Oligodendroglioma and juvenile pilocytic astrocytoma presenting as synchronous primary brain tumors. Case report with histological and molecular differentiation of the tumors and review of the literature. J Neurosurg 2004;100:700-5. Perry A, Scheithauer BW, Szczesniak DM, Atkinson JL, Wald JT, Hammak JE, et al. Combined oligodendroglioma/pleomorphic xanthoastrocytoma: A probable collision tumor: Case report. Neurosurgery 2001;48:1358-61. Poeata I, Besson G, Iliescu B, Faiyad Z, Indrei A, Dumitrescu GF. Meningioma association with Three Different Cell Types Tumors: Report of Clinical Cases and Review of the Literature. Romanian Neurosurg 2010;1:46-51. Shahar T, Ram Z. Hormonal effect on meningioma growth. World Neurosurg 2011;76:412-4. Russell DS, Rubinstein LJ. Pathology of Tumours of the Nervous System. 3th ed. Baltimore: Williams and Wilkins; 1971. p. 65. Alexander WS. 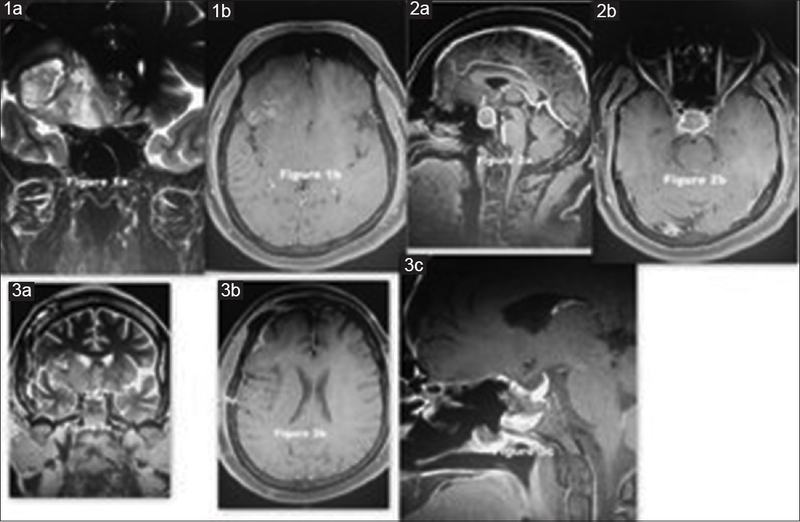 Multiple primary intracranial tumours; Meningioma associated with a glioma; Report of a case. J Neuropathol Exp Neurol 1948;7:81-8. Myerson PG. Multiple tumours of the brain of diverse origin. J Neuropath Exp Neurol 1942;1:406-15. Kitamura K, Terao H, Kamano S, Nakamura N, Hayakawa I, Ishijima T, et al. Primary Multiple Brain Tumors. No To Shinkei 1965;17:109-17. Prayson RA, Chowdhary S, Woodhouse S, Hanson M, Nair S. Collision of a syncytial meningioma and malignant astrocytoma. Ann Diagn Pathol 2002;6:44-8. Tokunaga T, Shigemori M, Hirohata M, Sugita Y, Miyagi J, Kuramoto S. Multiple primary brain tumours of different histological types. Report of two cases. Neurol Med Surg 1991;31:141-5. Hakan T, Armagan S, Aker FV, Celik L. Meningioma and glioblastoma adjacent in the brain. Turk Neurosurg 1998;8:57-60.